If you’re feeling creative, making party favors for a special event, want to start your own art projects or DIY décor, then there are craft stores throughout California to help you out. Depending on your crafting interests, you can find personalized service as well as a specialty area in various crafts. From fabrics and dyes to paints and canvases, find it all at the 10 best craft stores in the state. If you loved making things as a kid, then you’ll love Growing Up Arts & Crafts. Filled with kits, stickers, toys, tools, and more, Growing Up Arts & Crafts has a selection of fun to create crafts to help kids get the crafting bug. And help grownups discover they’re still a kid at heart. Mendel’s in the Haight District offers a vast selection of different kinds of fabrics and paints. You’ll find fake furs, dyes, fabrics, and more items and notions to create your own style. You can also find threads, needles, and anything else you might need. A third generation of Flax family owns FLAX Art & Design, which has been supplying the Bay Area with art and crafts supplies since 1938. Whether you’re just getting started or have years of experience, the staff at FLAX can help. Craft Labs is a unique craft experience because you get to create in an artist’s studio. Learn how to make everything from kids crafts to earrings with a friendly and patient instructor and then continue your crafts at home. If you love flowers and bouquets and want to make your own faux arrangements for weddings or other parties, head to CB Flowers & Crafts. You’ll find faux flowers, ribbons, and other accessories that you need to create beautiful arrangements. Maple Craft is the perfect place to head if you want party favors and other party supplies that are like no others. Ribbons, boxes, bags, accessories, and other sparkles and decorations are all found here. If you need a ribbon, chances are that you’ll find it at United Craft. You’ll also find all different ways to use ribbons including hair clips and headbands. There’s also cake toppers, decorations, and other details galore. Beverly’s is a California-based craft chain store with 18 locations throughout the state. Crafting, scrapbooking, and other hobby supplies as well as classes and instructions can be found at Beverly’s. Beverly’s also has many community projects and is always happy to have volunteers. 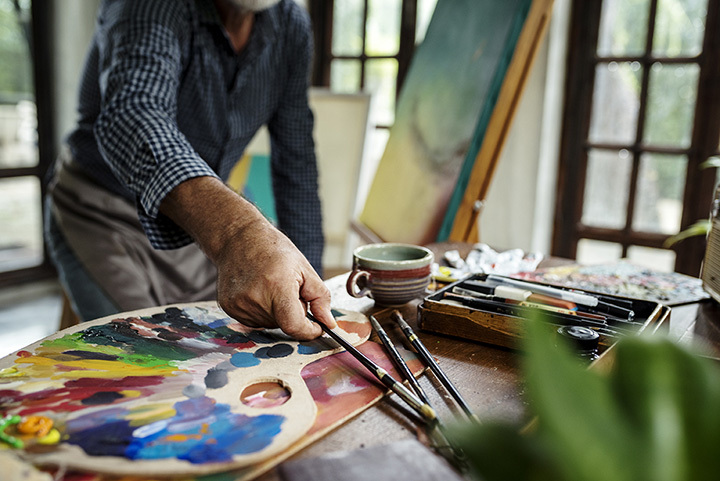 Whether you want to paint your own art for your home, figure out how to make a Pinterest-worthy craft or have another project in mind, you can probably do it at ArtBox. You can find artworks from a variety of artists in addition to a few other odds and ends. Border Leather expanded from just selling leathers to yarns. Thanks to a family interest, Border Leather has become a leading supplier of yarns for knitters. You’ll find free classes, books, and all the accessories you need to start knitting or up your game.